-Garson’s performance is what kept me interested in the movie, giving the role sweetness and likability in general, while also being tough or even selfish when she needs to. This is the first time I’ve seen her in a role where she can really shine and she ends up making an otherwise not very good movie to being pretty watchable. This was the first of five consecutive Best Actress nominations for Garson, a feat only matched by Bette Davis; she won the award once, for a movie we’ll cover next year and had 7 total nominations in her career. -The second half of the film is mostly good and is much more focused, doing a good job of sufficiently covering only a couple of important things and gives Garson a chance to show off her range. -The first half of the movie is a mess. The movie tries to cram in a ton of story points into a short period of time and the result is it devolves into “Cavalcade Storytelling”: it goes from significant event to a couple of years in the future to another significant event, then skips again, wash, rinse and repeat. The big problem with this is that the impact of those events are severely marginalized and we get emotional whiplash: more than once we see a horrible tragedy that would have a dramatic effect on a person, then immediately we transition to 2 years in the future and everybody is happy and the previous event isn’t mentioned. This is a really bad way of telling a story and is happens when you have a bunch of things you need to cover but don’t allocate enough to time to do it the right way. Furthermore, a lot of these points didn’t even need to be there, as they didn’t actually happen (as far as I can tell) and are only there because the movie things the main character needs very specific and obvious motivations for why she takes up her cause. -There are a number of black servant characters in the movie and they’re all represented in a very stereotypical way for the time period which gets grating and distractingly bad everytime they show up. This is about a woman whose story deserved to be told, and Garson was a great choice to play her. The problem is that they should have told the story with a script that flows better and doesn’t resort to cheap (and fictitious) heart-string pulling moments for a story that’s compelling enough without them. -The screenplay is excellent for a number of reasons. First, consider the level of difficulty: it must tell an effective story of a man’s life over the course of 60 years, and it is nonlinear with multiple narrators telling Kane’s story from their perspective. This was (and still mostly is) a very unusual way of telling a story, but it works really well because it fits with the central theme of figuring out who Kane really was as a person. Second, it’s difficult for a modern viewer to fully appreciate how good the ending is because everybody knows what Rosebud is by now; nevertheless, it still brings everything we’ve into a clear focus. Finally, it’s story about the rise and fall of a man who loses sight of what he actually wants in life is both complex and simple, which is why it has such broad acclaim and is worth re-watching periodically, as you get something new out of it each time. -This was the first film score for Bernard Hermann, who would later go on to score most of Alfred Hitchcock’s movies starting in the 1950’s. While I didn’t like it as much as most people seem to, it was still very good. This film completely succeeds on a technical level in cinematography and script writing, but I didn’t love this film the first time I saw it in high school and while I like it better now, I still don’t love it. Among other things, the idea of examining the life of a character when we already know his whole arc is intellectually interesting, but removes some of the intrigue for me. It’s a great movie but will never be one of my favorites. Citizen Kane is one of the most acclaimed films of all-time by critics and it’s easy to see why, considering how strong it is on a pure technical and screenwriting level. If you somehow have never seen it, you should, but don’t go in with super-inflated expectations. -This is (well, was before it was remade twice) a really original and creative story that’s a lot of fun. The three male lead characters are all distinctive and entertaining with strong performances. Montgomery was perfectly cast and comes off as a simple guy with a big heart who’s extremely likeable, Claude Rains continues to be good in almost everything and Gleason deserved his nomination for his goofy and haggard performance as Montgomery’s trainer. Finally, the movie successfully tows the thin line between sweet and saccharine really well. -Bruce Farnsworth’s wife and secretary aren’t very interesting characters (they’re there because the story wouldn’t make sense without them being there) and Ms. Logan (Keyes) is mostly a bland, attractive love interest who doesn’t have a lot of personality. These are things that ultimately aren’t THAT important in the movie, but keep it from being a really great movie. -The 1978 Best Picture nominee Heaven Can Wait was not a remake of the 1943 Best Picture nominee Heaven Can Wait, but of this movie. What apparently happened was that Here Comes Mr. Jordan was based off a play that was called Heaven Can Wait, so the remake went with the play’s title. Still confusing to the unassuming viewer: you would expect a remake movie that is called Heaven Can Wait would be a remake of Heaven Can Wait. -Charles Boyer’s voice makes him a great narrator (which he does as the main character semi-frequently) and even with his receding hairline, he’s still charming and entertaining. Love his eyebrows too. -Interesting to see a movie from this time period deal with the topic of immigration (it’s very much pro) in a time when there were strict quotas and a ton of people trying to flee from the invading Axis powers in Europe. -The romance story here isn’t anything special, but it’s above average and picks up towards the end when everything comes to a head. -Slow moving and the story isn’t presented in an effective way way. A lot of the time the movie just kind of dithers about, and even though the movie is about Boyer’s quest to get into America, I didn’t get a sense of any pressure-why it was so dire that he get across, as he seemed to be doing just fine in Mexico. -Not a negative really, but despite getting an Oscar nomination, Olivia de Havilland is again just fine here (although she has a nice scene towards the end). She has a strong reputation, but she continues to play mostly uninteresting roles, and I don’t think I’ve especially like her in anything. One interesting note: despite growing up in Britain, de Havilland and her sister Joan Fontaine both went to Los Gatos High School near San Jose, CA (and I live about 20 minutes from there). -This was legendary costume designer Edith Head’s first screen credit in a Best Picture nominated movie (she had done uncredited work on Wings and She Done Him Wrong); over her incredible career, she had 8 Oscar wins and 35 nominations. 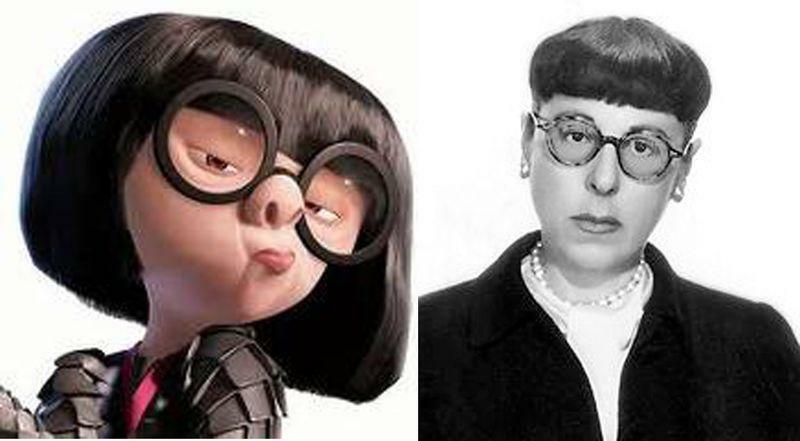 She was later referenced as the basis for the character Edna Mode from The Incredibles (http://nerdipop.co.za/wp-content/uploads/2015/04/edith-edna.jpg). Nothing especially interesting here, but nothing that pissed me off either. Watch this if you really like Charles Boyer (who is good), but otherwise this is an unmemorable romance movie. -The performances are are solid, with McDowall probably doing the best considering he has to play the lead and does a great job despite only being 12 years old at the time. I can also see why Crisp won an Oscar playing the patriarch of the family, as another actor might have tried to chew the scenery, where he instead plays a believable gruff, sturdy, old-fashioned man in changing times. -This is a well-made and well-acted movie, but I just didn’t find it to be terribly interesting. This movie feels like a companion piece to Ford’s The Grapes of Wrath, but everything this movie does well that movie did better, especially when it comes to memorable characters, acting, cinematography and sound design. Additionally, I think as an American, I’m more interested in the depression than the plight of Welsh miners, but I also think TGOW was more focused on its themes and presented them more effectively. I can appreciate this movie, but it didn’t grab me. This movie is mostly remembered now as the film that stole Best Picture from Citizen Kane. I don’t think it deserves that reputation as it is a good film in its own right, but I agree that it’s the weakest Best Picture winner in a while. -There’s one scene towards the end of the film involving Davis and Marshall that’s as good as anything you’ll ever see and is perfectly shot and acted; if you’ve seen it, you know exactly what I’m talking about. -I liked Davis’ white makeup that completely cakes her face, as it looks visually striking and fits into the theme of power and aging: that whatever power struggles you can win, the one against age isn’t one of them, which makes your legacy the most lasting influence (through your acts and through your children) you can have. -The movie’s central theme of the wicked getting away with plundering the earth as long as good people are afraid to act is good, but it would have been more effective if the good people in the movie were more developed. Wright’s character is central to this theme, but I don’t think she had enough character development to elevate her from anything more than simply being a good person who finally has had enough. Fundamentally, it’s hard to root for the good guys when the bad guys are so much more entertaining and colorful. This is a very good movie with plenty of entertaining characters and a strong central theme, although some of those themes are hard to invest in because as awful as the villains are, they are the best characters. -The story speeds along at a breakneck pace while still conveying all the information it needs to through its great dialogue. Underlying the whole movie is just how fun and exciting it is-we’re sent on this dizzying journey with a fantastic cast of characters where everybody is lying about everything and we have no idea what is coming next. Easily one of the most enjoyable movies I’ve watched so far. -The whole cast is great, and I’ll highlight two of them. The character of Sam Spade is a total badass and Humphrey Bogart seems like he was born to play him (even though this is actually the third time this story was filmed). This and the film High Sierra put Bogart on the map as one of the top leading men in Hollywood. The other is Sydney Greenstreet (in his first film role), who has an extremely memorable turn as Kasper Gutman due to his size and his cadence and would play a number of similar roles over the next few years. I’m amazed this was John Huston’s directorial debut, even if he was a long-time screenwriter and the son of Walter Huston. This movie pretty much defines film noir and what people like about it. This was the first film I really debated giving an A+ to and down the line, I might re-evaluate and give it that, but for now I give it an A and just say watch this movie if you haven’t seen it.